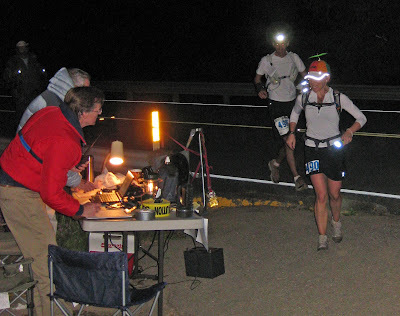 Ok, the results are in, and headlamps rule the night in this unscientific poll on the types of lighting ultrarunners prefer to make their way on darkened trail. Headlamps by themselves (with no other light sources) came up tops, preferred by 35.5 percent of runners. When this percentage was combined with those who prefer a headlamp on the head as well around the waist, the percentage of folks using headlamps to light the way jumped to 64.5 percent. Surprisingly, flashlights by themselves, with no other lighting sources came up with a low 6.5 percent. Save some from the new generation of super powerful headlamps, I'd choose a flashlight alone over a headlamp alone any day, just given the relief flashlights reveal. Finally, those choosing a headlamp and handheld flashlight came out to 29 percent. About ten years ago I read an article in the newspaper about the resurgence of men's hats - of the fedora, bowler varieties. One of the men quoted in the article, who'd recently bought a Homburg - a type of hat with a fashionably rugged style - said that whenever he put it on and went outside it made him feel like he was carrying a loaded gun. Hyperbole, of course, and probably just plain ludicrous. But I nevertheless think of that quote every time I reach into my drop bag in the waning light and pull out my Fenix L2D Q5 flashlight for a long night on the trail. Something about this light just buoys my confidence. I've used it on two long-night runs - Coyote Two Moon in March and Wasatch Front in September - and one short-night run - Bighorn 100 on the solstice - and in all settings, on all types of darkened trail, it was flawless. With up to 180 lumens, it's got plenty of power to light the way. Its focused beam is great for searching out trail markers, harrowing drop-offs, or those things that go crack in the night. The brushed aluminum body of the L2D feels solid in the hand (even a sweaty hand) and wipes off easily when gel loading goes bad. And for the brightness it delivers, it's compact and light. Best of all, and the main reason I bought mine in the first place, is the battery life. In medium mode (53 lumens), with just two standard AA batteries, the L2D shined brighter and longer than I needed it to at Coyote and Wasatch, each with nighttime running between ten and eleven hours. As with most anything, there are some minor frailties worth noting. First, some folks with bigger hands might actually find the light too small in diameter to comfortably carry for hours on end. My hands fit solidly in the "medium" bin, and the L2D works nicely for me. Those in the L/XL range, though, may find it a bit small. Second, and this is likely the biggest frailty, the L2D is pricey. It retails for around $60.00; though, there are some deals out there since it's being sunsetted for the newer LD20. Overall, though, if you're looking to run your first or your fiftieth nighttime trail run and you've got a few dollars stored away, the Fenix L2D is a great light source that'll get you where you're going with confidence, and on just two AA's. For detailed specs on different brightness modes (including SOS flashing! ), lens coating, and other things I can in no way assess properly, click here. More reviews on Run Junkie (reviews).